HIGH-QUALITY: The e-bike adopts high-strength carbon fiber steel and superior car paint with 26inch aluminum allo, the bike can use for several years. LITHIUM BATTERY: The 36V,10AH Ion lithium battery of this ebike is removable. The bike equipped with smart lithium battery charger can make you ride up to25-28KM/h. 250W high speed brushless gear motors easily assists you to travel at range of about 40-45KM. 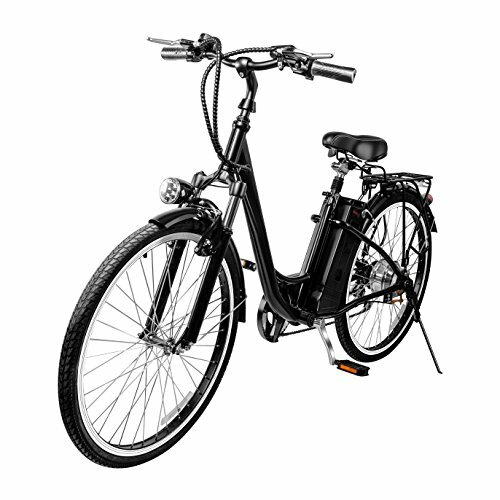 SAFETY: This electric bike with front brakes, you can choose any speed according to your needs. The perfect brakes fully protect your safety. And the horn and the bright LED headlamp are equipped for night riding. If you have any questions about this product by VEEKO, contact us by completing and submitting the form below. If you are looking for a specif part number, please include it with your message.